Situated in Sun Peaks, this ski hotel is within a 10-minute walk of Sun Peaks Golf Course and Sun Peaks Resort. 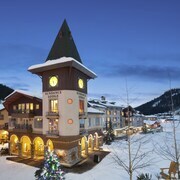 Located in the heart of Sun Peaks, this ski hotel is within 1 mi (2 km) of Sun Peaks Golf Course and Sun Peaks Resort. 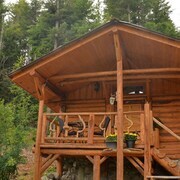 Situated in Sun Peaks, this romantic vacation home is within 1 mi (2 km) of Sun Peaks Golf Course and Sun Peaks Resort. Location was good, we wanted something inexpensive and easy access to the hwy for skiing at Sun Peaks. Breakfast was simple but good for starting our ski day at Sun Peaks. Drove to Sun Peaks every day and cooked with our kitchenette. We stayed here for just a night on our way home from Sun Peaks. It was very warm at sunpeaks and we attended a wedding there as well. Great Location, nice village. Will return for sure. Summer has lots to offer as well. Where to find Sun Peaks hotels near an airport? Where can I find hotels in Sun Peaks that are near tourist attractions? Searching for a comfortable hotel while you are in Sun Peaks? 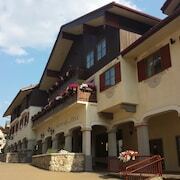 Expedia's extensive database lists 15 places to stay within 0.1 kilometres (0.1 miles) of central Sun Peaks. There are a number of Expedia hotels within a 10 kilometres (6 miles) radius, like The Residences at Sun Peaks Grand and Crystal Forest by Bear Country. 4 kilometres (2 miles) away from the middle of Sun Peaks, is the Kookaburra Lodge by Bear Country. 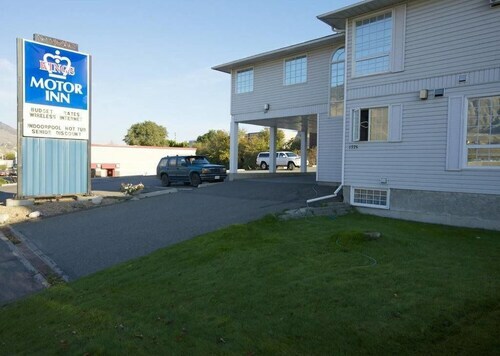 The Sun Peaks Grand Hotel & Conference Centre can be found 4 kilometres (2 miles) away. If you'd prefer, you could investigate the South Thompson Inn & Conference Centre or The Pinnacle Lodge. Like to venture a little further afield? 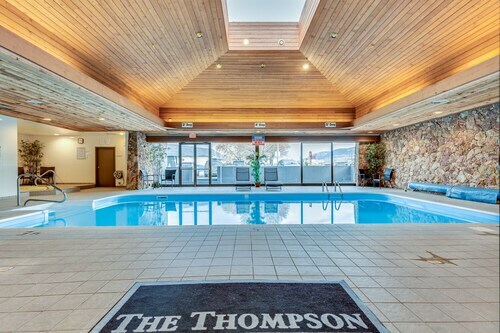 Thompson Okanagan has many things to see. 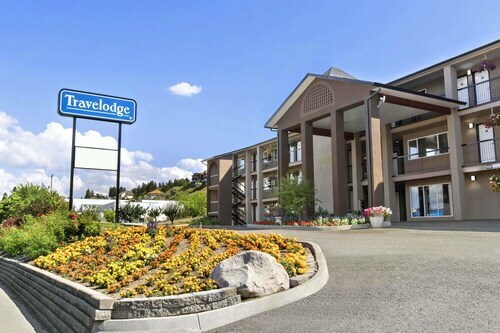 Lovers of the great outdoors will appreciate Thompson Okanagan's rural landscapes, beaches and forests. You should also spend time at a selection of the region's old towns. Active visitors may also try their hand at snowboarding and skiing here. 20 kilometres (12 miles) to the east of Sun Peaks is Chase, where you can spend the day enjoying the Sunshore Golf Course and Adams Lake Recreation Conference Centre. Should you wish to visit Chase, check Expedia's booking pages for the latest deals at the Quaaout Lodge and Spa, Talking Rock Golf and Jade Mountain Motel. 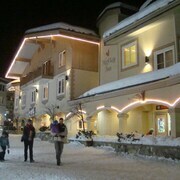 35 kilometres (22 miles) to the north of Sun Peaks is Barriere, home to the Knights Inn Barriere and Monte Carlo Motel. The Chinook Cove Golf Course and North Thompson Museum are a couple of the popular attractions to see when visiting Barriere. Salmon Arm can be found 50 kilometres (31 miles) away from Sun Peaks. While you are in the area, make sure you investigate the R.J. Haney Heritage Village and Museum, DeMille's Farm Market and Centenoka Park Mall. The Salmon Arm Wharf and Salmon Arm Water Slides are also well worth visiting. The Quaaout Lodge and Spa, Talking Rock Golf and Best Western Sicamous Inn are a selection of Expedia-listed places to stay in Salmon Arm. Sun Peaks features some terrific things to see and do. Learn more over at Expedia's up-to-date Sun Peaks travel guide. When not playing hard on the slopes and trails, people here are enjoying the finer things in life. True to its status as a resort town, Sun Peaks offers a multitude of refreshing spas, elegant boutiques, and amazing restaurants. The nightlife here offers close to a dozen pubs and lounges for you to let loose at. The vibe here is cheerful, casual, and adventurous. As you mingle with your fellow high-octane travellers at adventure hotels in Sun Peaks, you just might form some lifetime bonds. Sun Peaks shares the climate of the nearby city of Kamloops. The influence of the Coast Mountains leads to cold temperatures and constant powder through the winter months. 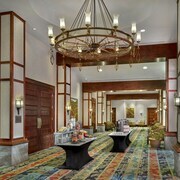 The resort town’s elevation creates sunny and mild temperatures in the spring and summer months. Since the climate and altitude of the area create the perfect recipe for popular vacations year round, travellers are advised to book a Sun Peaks hotel well in advance of their arrival. You’ll love downhill skiing or navigating jumps at a terrain park during your time in Sun Peaks. You can slow down the pace to participate in a wine festival, car show, or outdoor concert. The resort town hosts a farmers' market throughout the summer. You’ll get a chance to grab fruits, meats, seafood, vegetables, crafts, and beauty products from British Columbia’s farmers, ranchers, and artisans. You can also head to Heffley Lake for a paddling lesson or canoe ride. Curious about how to squeeze all the top attractions into your itinerary for one cheap price? The best deals on Sun Peaks vacations are just over the next hill. Getting excited to party on the mountain at Sun Peaks? Just wait until you get a peak at the amazing deals we have on Sun Peaks hotels. To put a little extra wind at your back, we’ve also created amazing package offers that feature discounts on flights to Sun Peaks. If you want to stay near all the snowy hills, flowery meadows, and fabulous amenities that this resort town has to offer, don’t hesitate to book your Sun Peaks hotel here with us at Expedia today. What are the most popular Sun Peaks hotels? Are there hotels in other cities near Sun Peaks? What other types of accommodations are available in Sun Peaks? Explore Sun Peaks with Expedia.ca’s Travel Guides to find the best flights, cars, holiday packages and more! Flights from Macdonald Cartier Intl. to Barcelona Intl. Flights from Hancock Intl. to John F. Kennedy Intl. Flights from Edmonton Intl. to Sardar Vallabhbhai Patel Intl. Flights from Edmonton Intl. to Bahias de Huatulco Intl. Flights from John C. Munro Hamilton Intl. to Orlando Intl. Flights from Edmonton Intl. to Chhatrapati Shivaji Intl. Flights from Vienna Intl. to Pearson Intl. Flights from Kingsford Smith Intl. to Vancouver Intl.